With the release of a second generation FireWire 800 model, Drobo has repositioned itself from a convenient backup system to an everyday workhorse that also archives your data. 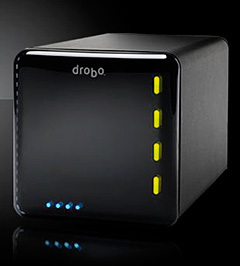 'The second generation Drobo incorporates all of the features and functionality that consumers have grown to know and love in its predecessor: unparalleled ease of use, redundant data protection, and instant expandability that allows storage capacity to grow with users over time. New enhancements include an upgraded core processor, two FireWire 800 ports, dramatically increased USB 2.0 performance, and newly optimized firmware. This release addresses the needs of any user seeking a reliable method of managing vast amounts of data without sacrificing performance; from video editors, to heavy down-loaders, to photographers who shoot raw images,' reports data robotics in their press release. So now you can use the device for realtime photography production, video editing, and other demanding tasks. 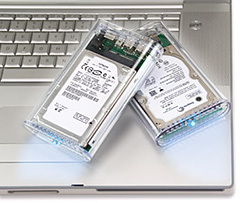 Drobo's peace of mind comes at a price, as you would expect. Using the Drobolator to calculate available free space, you'll see that if you fill the Drobo up with four terabyte drives, your available data space is 2.7 TBs. 931 GBs is used for protection, and 3.8 GBs is reserved for overhead. But this is still more efficient than one-to-one backup. And that backup data has to go somewhere. I have a first generation Drobo for managing my photo archive. I originally had it on an AirPort Extreme network, but I've since moved it to a workstation so I could connect the USB 2.0 cord directly to a computer. Since I've made that adjustment, I've been more satisfied with its performance as a backup machine, especially when searching for photos with Expression Media. But I'd love to try the new FireWire version. If anyone has any hands-on reports, please post a comment and let us know a little bit about your set up too. My favorite presentation yesterday at the Microsoft Pro Photography Summit was by landscape photographer Frans Lanting. It began when he captured through his lens thousands of Horseshoe Crabs as they came out at night on the New Jersey shores. Frans felt like he was looking back in time, and began to wonder what other examples he could find and photograph. And that was the beginning of his project, LIFE: A Journey Through Time. 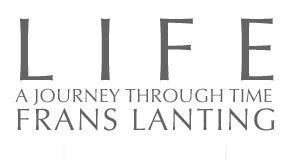 You can visit this project in many ways, through the book, via the traveling exhibit, and of course, seeing Frans speak in person. The web site also provides an excellent experience, and I think you would enjoy spending a little bit of your life there marveling at the photos and learning from the text. 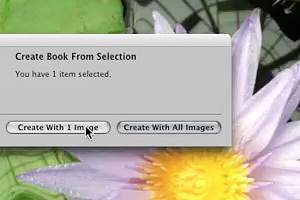 I've just published the first of five Aperture screencasts on Inside Aperture; this one is on custom layouts using the book making tool. I walk you through the process of making your own postcard, but you could use the tutorial to design posters, fliers, and anything else your creativity comes up with. Next week's screencast will feature the Retouch tool. 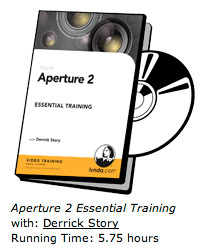 These screencasts, plus 60 or so others, are available as part of my Lynda.com title, Aperture 2 Essential Training. I've always had a fondness for luster finished papers and had been looking forward to trying Red River's 75 lb Arctic Polar Luster. This was going to be a dual test actually, because I had a new HP Photosmart Pro B8850 Printer sitting in my studio full of ink and ready to output. Why not test both at once? First thing I did was download the color profile from the Red River site. They had the Arctic Polar Luster profile for the HP B9180, and I knew it would work fine in the B8850 since it's really the little brother to the B9180. I downloaded the profile and used the "Add Custom Paper" option in the Paper Type/Quality dialog box to add my profile. Now I was ready to print. I first output a test print on HP Advanced Glossy Photo Paper so I would have a control image to compare against. I then loaded up the Artic Polar Luster and printed the same image. I compared both images to the picture on my calibrated Apple Cinema Display. The colors were almost identical in both prints to what I was seeing on the screen. I say almost identical because the HP paper is slightly warm and the Red River is slightly cool. This had a mild impact on the rendering of the colors. The tones were more saturated on the Artic Polar and the image was slightly darker. Not so much darker in a bad way, but very rich. I made a second print slightly increasing the gamma in the print dialog box. The colors were still quite luxurious, but the tones were about the same as my test print on the HP glossy. Holding the prints brought to light a bigger difference between the stocks. The 75 lb Artic Polar Luster was substantial and felt like artwork in the hands. I couldn't set it down. And the finish is exactly what you'd expect from a premium luster stock: less reflection with rich tonality. I did a little price comparison to see how much the Red River stock would cost me. A box of 50 sheets of 13"x19" Arctic Polar Luster runs $85.95. On the HP side, a box of 25 sheets of Professional Satin Paper runs $62.99. So the Red River runs about $1.70 a sheet compared to about $2.50 a sheet for the HP Satin. The Red River is 13 mil thick compared to 11.4 mil for the HP Satin. So it doesn't look like you have to pay more for this terrific luster stock. As for the HP B8850 printer, it's output was every bit as beautiful as the B9180 I use often. It seemed a little slower however, and I'm going to continue testing and will post a follow up report. But the print quality was outstanding on both paper stocks tested in this report. Lynda has also released three free videos on the catalog page, and I'm going to publish five more free videos on Inside Aperture, starting with the first one this coming Tuesday. These are good screencasts too, featuring managing previews, levels adjustments, retouching, lift & stamp, and custom layouts. That leaves another 66 videos for subscribers to enjoy on the Lynda.com site. If you've been waiting to dig deep into Aperture, wait no longer. This title will get you up and running quickly. Finally, use a wide angle lens so you can capture as much of the sky as possible. If you know the display is going to peak in a certain area, you can zoom in a bit. Remember, since you're shooting at the highest resolution possible, you can always crop your image later. You will also find it helpful to use manual focus mode if your camera has it. 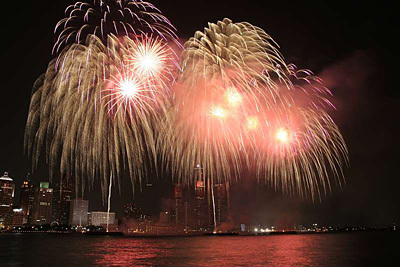 Some compacts have a "Fireworks" scene mode. If you're toting a point and shoot, check you scene mode menu. You might be pleasantly surprised. The Fireworks scene mode usually works quite well. Finally, after days of interrupted service, the Digital Story podcast feed is working again in iTunes Music Store. This was not an iTunes problem, but something that happened on our side of the fence. 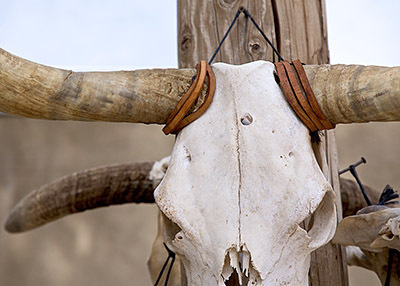 We tried to modernize our feeds and ended up breaking them all together in the process. If you subscribe to The Digital Story in iTunes, all you have to do now is go to the Podcasts section in iTunes and hit the Refresh button. Our feed should now work and you will get the latest episode, Self Assignment. If you have a problem getting the show in iTunes, please post a comment here so we can troubleshoot the situation. As you can imagine, I feel terrible about this inconvenience. I'm hoping we have everything now wired up correctly. Other World Computing has recently announced their Mercury On-the-Go 320 GB FireWire portable hard drive. The specs are perfect for photographers on the go. In a compact package that fits in your back pocket, you get lots of capacity, 7200 RPMs (fast for a portable), bus powered (no electrical adapter required), and three interfaces (FireWire 800.400 and USB 2.0). The going price is $280 US. One of the big topics this week in my Photoshop Lightroom workshop in Santa Fe has been portable storage. Having a 320 GB drive (or two) seems like a good option for Raw shooters who work in the field. I took our class from Santa Fe Workshops to the Tent Rocks National Monument yesterday morning to capture some good content for our work in Photoshop and Lightroom. 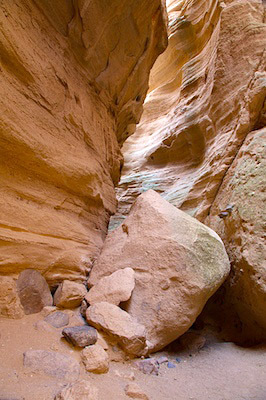 It's a terrific location with a variety of rock formations including a slot canyon. For this shot, I mounted the Canon 5D with the 24-105mm L lens on a tripod, and shot in Aperture Priority mode so I could stop down to f-11. I wanted to keep the ISO at 100, so I needed the tripod for the long 1/2 second exposure.